Cheryl Pierson is a native of Oklahoma. She lives in the Oklahoma City metro area with her husband. Her short stories have been published by Prairie Rose Publications, Western Fictioneers, Adams Media, Chicken Soup, and Western Trail Blazer. She has six novels to her credit: Fire Eyes, Time Plains Drifter, The Half-Breed's Woman, Gabriel's Law, Sweet Danger, and Temptation's Touch. 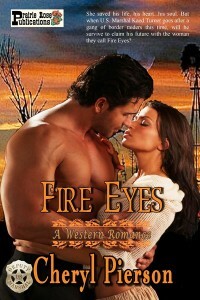 Her novel Fire Eyes was an Epic Award Finalist. Cheryl received the PNR PEARL Awards' Honorable Mention as Best New Paranormal Author of 2009 for her time-travel paranormal western Time Plains Drifter. 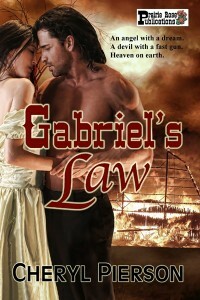 She also placed third in the San Antonio Romance Authors Merritt Contest with her novel Gabriel's Law. Writing is so much a part of her life that recently she and long-time friend Livia Reasoner, opened a publishing house. Prairie Rose Publications furthers the western-themed writing offerings of women. Having a child. Actually, having two of them. Life is one big adventure when you have a baby—you never know what to expect next, and I still don’t, even though they’re 27 and 24 now! I’m not a big risk-taker except when I visit the casino three or four times a year. So, probably I would say something like traveling to Ireland just to see it, and if I could, I’d want to complete some genealogy research while I was there. Oh, another big adventure: I’d like to open a rescue for animals like The Gentle Barn, where they just live out their lives there—all kinds of animals together—cows, horses, pigs, goats, dogs, cats. You name it, they’ve got them. Hmmm. I read so many different kinds of authors, I’m not sure there is a commonality in them. I read a lot of westerns, romance, and mainstream. Right now, I’m reading The Help, by Kathryn Stockett. One of the best books ever. Her “voice,” going from the black “help” to the white rich girl, is just flawless, and I enjoy seeing that no matter who she’s writing about—white, black, rich, poor—they all have their own problems. But I also love western romance authors—which I started reading in my “adult” life. Sweet Savage Love, by Rosemary Rogers, will always remain one of my favorite romance books in any genre. Another favorite romance writer is Christine Monson, who wrote in many sub-genres. She’s no longer with us, but her books are just wonderful—so realistic. I just finished Penelope Williamson’s book Heart of the West, which I really enjoyed. I think if I chose a commonality, it would have to be the realism that each of these authors is able to portray. That’s a hard one! When I was a little girl, it was magenta. And it was that color all through school, up into high school. Then, of course, that was the ’70s—so it was a rainbow world. I truly like all colors—even black. But probably oranges, yellows, golds, and browns are my faves. What I would do again: I would have my kids again. They are the dearest things in the world to me. Truly, I don’t have a process. I come up with a scene and the thought processes are running wild. What might happen before or after? How did they get to this crucial scene? Then I have to come up with the story to fit the scene and the problem. I write everything longhand. Then I type it into the computer and edit it as I go. Typing helps me see when I’ve left out a word or used the same word too closely together in an “echo,” and I can fix that as I go along. Are you a planner, panster or both? I’m mainly a pantser. It makes me nervous to have things too well planned out. I do use a timeline for plotting purposes, but only after I’m well into the book. I live in Oklahoma, so a lot of what I write about I’ve learned in school or through just living here. I do research, too, if needed, but most of my books just flow without a ton of extra research, and I’m glad of that. Another tough one! Probably my all-time favorite movie would be To Kill a Mockingbird or Gone With the Wind. My all-time favorite TV show would have been most any western that was on. Even now, if I’m searching for something to watch and I see Lucas McCain or Ben Cartwright, I stop to watch. How important do you feel writing workshops are to writers? It depends on the writer, the workshop, and the teacher of the workshop, truly. Some people don’t live in an area where they are able to physically attend, but there are some excellent online writers workshops that are very reasonably priced. But like anything else, I believe these are more beneficial for some than for others. Critique groups are another story. NO CRITIQUE GROUPS. NO WAY. NO HOW. Too many opinions about your story can make you doubt yourself to the point of quitting. I’ve seen this many times. Trust yourself and just write. Hmm. I’m not really sure, because I’d also have to have time be no deterrent, either. Seems I don’t have enough hours in the day as it is. But if that were no deterrent either, I would say it would probably be how to speak some of the Indian languages and teach them to others. These languages are dying out and need to be kept alive. That can only happen if we take a hand in making sure they’re taught to the younger kids. If you had a million dollars to donate to any one charity, which charity would it be? It would be given to animal charities—so many good rescues out there that do so much good and often are kept going by the workers’ own money when funds run out. Oklahoma Rescue Rangers is a good one; Safe Haven is another. But there are so many, I would probably have to break it down and give a few thousand to several of them to make that million bucks do the most good. Don’t ever quit, and don’t join a critique group. I never really had a mentor. I knew from early on that I wanted to write, but wasn’t sure what I wanted to write until I read Sweet Savage Love when I was about 19. Then, I knew exactly what I wanted to do with my writing. I think, because it was so hard to try to learn it all on my own and by trial and error, I’ve always wanted to help others any way I could in this business. That’s the main reason Livia and I opened our publishing company and its multiple imprints. What sticks in my mind is this: When I was growing up, I had a piano teacher who was a very strict woman. We were always getting ready for recitals or competitions. I hated both of those things, but they were expected. My mom used to tell me, “Cheryl, remember: There’s not another person in the room who can play this particular piece of music better than you can. Today, you are the best at playing (whatever it might have been) in this room.” At the time, it made me feel somewhat better, but as an adult, I understand what she was trying to do to help me realize that everyone has their own talent. That’s helped me immensely in my writing. I can’t ever be anyone else but me, writing my stories better than anyone else in the proverbial room. And each author should feel that way about their writing. It’s so personal, how could anyone tell your story better than you? It’s not possible. I’ve often thought of moving near the ocean, but I know I’d get homesick for Oklahoma. Part of my family has been here forever, as Indians, and the “newcomers” showed up about six generations back. I guess I’d have to say I would just stay right here where I am. We have a beautiful Florida room that looks out onto the backyard and the pool. That’s usually where I do my writing. It’s really relaxing. From my own writing, yes, I do take time off. But from work—editing other people’s manuscripts, running Prairie Rose Publications and its imprints, and just the constant business of writing—no. I never take a day off. I don’t have one. If I want to try it, I do it. Sarah you’ve done such a great job of interview questions, I don’t believe there’s anything they don't know about me now! We’re always looking for submissions at Prairie Rose Publications and our other imprints—just a reminder to readers if you have anything you might want to submit to e-mail me at prairierosepublications@yahoo.com. Find out more about Cheryl and her books here.